As we approach the finish line of the 2011 academic school year, it amazes me just how much both our Year 7 and Year 8 students have matured and developed into confident young Galen ambassadors. Staff at Galen College feel very privileged to teach such great students. The Grade 6 Transition camp at 15-mile Creek was a huge success. The students from small rural primary schools really appreciated the chance to meet students from other schools before orientation day. A big thank you to Miss Lauren Lee and Mr Zac Fulford for their outstanding efforts on the overnight camp. 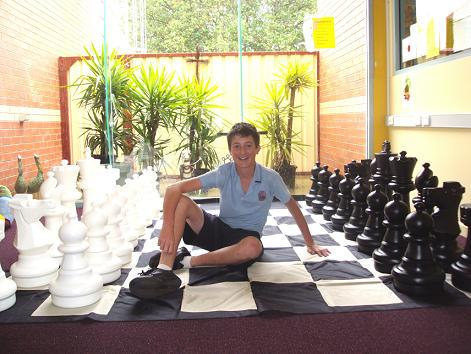 Last Friday 25th November the Junior school SRC had the pleasure of presenting Mrs Rachel Froude (head Junior School Librarian) a set of life-size chess pieces to be used in the Junior School (see right for photo of Blake Nixon 8/4). Business manager Mr Domenic Giannone was also present as he will organize the marking of the chess court. We had the final 2011 Junior School inter-homeroom competition last week, which was a very competitive Downball competition. It was a tightly fought contest in year 7 with 7/8 Alex Reid winning the boys competition and Gemma Enever from 7/6 winning the girls. 8/1’s Aaron Taylor won the Year 8 boys downball and Bella Gigliotti from 8/6 won the girls competition. After a year that has been full of Year 7 and Year 8 competitive inter- homeroom competitions, I have the pleasure of announcing the final ladders of 2011 – Events this year included; Tennis, Spelling Bees, Volleyball, Chess, Netball, Trivia, Maths, Science, Basketball, Readers Cup, Essay writing, Downball and a Talent Quest. Congratulations to all homerooms and homeroom teachers for supporting the inter-homeroom competition in 2011. The winning homeroom from each year level will have a free pizza lunch on Wednesday 7th December. On Thursday 24th November we had some Grade 6 students from Our Lady’s visit Galen in preparation of Orientation Day. It was great to witness Year 7 students assisting Grade 6 students in the science class. Orientation Day has been set for Tuesday 13th December. Information will be mailed to incoming Year 7 students and parents later this week. The booklists will also be in the mail out. Congratulations to our Year 7 Boys tennis team for making the grand final of the VSSSA State tennis competition. Matthew Wilson, Zac Sullivan, Sam Harvey, Fletcher Stewart and Harry Condon. Mrs. Hill has done a tremendous job coaching these talented boys and is confident that they will play well. The State final will take place this Friday 2nd December. We wish Mrs Hill and the boys good luck. I would like to take this opportunity to thank all the Junior School students, teachers and parents for contributing to the success of developing our best assets which of course are our students. We are very fortunate to have excellent homeroom teachers in the Junior School and I would like to formally thank them for their efforts all year long. Thank you also to our Year 7 & 8 Coordinators Miss Lauren Lee and Miss Jessica Clarke, for your contributions. We also wish our year 7 homeroom teachers Mrs. Kylie Fulford and Ms Gretta Norden all the very best over the holiday break, as they are both pregnant and will be expecting in April in 2012. Both teachers will be on maternity leave into Term 1. We can’t wait to have them back after their leave.